Having a right side chest pain is a reason to worry but not a reason to panic. Generally, only pains in the left side of the chest are linked to heart problems, but pain in the right side of chest can have a wide variety of causes, some of which can be life-threatening health problems. Even so, most right side chest pain is not a sign of major health problems. You should consult a medical professional, if such a pain persists and gets out of control. Indigestion or heartburn is one of the major causes of such pain. Indigestion occurs when stomach acid gets into the esophagus or windpipe causing the stomach filled with undigested food. Many people have indigestion these days because of a poor diet, medications, stress, smoking and drinking too much of certain liquids like alcohol and coffee. Most people can overcome indigestion by turning to a healthy diet, getting rid of bad habits and using probiotics to restore the good bacteria needed for digestion in the stomach. Basically, Gastroesophageal Reflux Disease is chronic indigestion that doesn't go away. The cause is usually problems with the digestive system, such as infections or a lack of bacteria needed for digestion. Medical treatment is necessary if indigestion does not clear up on its own. Food blockages: The esophagus, the tube that connects the mouth to the digestive system, is very small and it can easily get blocked, causing pain and requiring medical attention. Viruses like those that cause colds and the flu can cause pleurisy and pain in right chest. The pain usually occurs while you breathe or cough. In a healthy person, these infections usually clear up with rest. You can avoid some of these pains by getting your flu vaccination every year. The gallbladder is a small pouch under the liver that stores bile, a substance necessary for digestion. The gallbladder can get blocked and infected, usually by gallstones. This can create sharp pain in right side of chest. In order to make a diagnosis, doctors will need to scan or x-ray your chest. There are a wide variety of treatments for gallbladder infections, including surgery and antibiotics. The good news is most people will recover with proper treatment. Pain that gets worse when you lie down often originates in the pancreas. The pancreas is a small organ and can be associated with serious health problems, including cystic fibrosis, cancer and diabetes, so medical help is needed. The usual cause of liver inflammation is an infection of the liver or hepatitis. It can also be caused by alcohol abuse, toxic chemicals and some other problems. Hepatitis can be treated with antibiotics, but it does require medical care because serious cases can be debilitating. This condition is caused by an infection that creates inflammations around the lungs. Pleurisy causes pain when a person coughs or breathes. It isn’t as common anymore because of antibiotics and other medical treatments. You should seek medical care because it can be a symptom of serious infections, such as pneumonia. Lung problems, including asthma, bronchitis, emphysema and infections can trigger pain in right side of chest. Such problems are often worse in smokers and people with damaged lungs. Pneumothorax is a serious condition that occurs when a part of a lung collapses. Pneumothorax usually occurs after an injury such as those from falls and car accidents. If you experience right-side chest pain after an accident, you should seek medical help immediately. Pneumonia occurs when the lungs fill up with fluid and over 50 different infections can cause it. Some causes can be prevented by vaccines, but severe cases can be fatal so medical care is needed. This kind of pain can be caused by some heart problems, including heart attacks, angina, cardiomyopathy and the like. Angina can cause chest pains accompanied by discomfort, heaviness, aching, burning and pressure is usually a symptom of heart disease. Aortic dissection occurs when a small tear develops in the aorta, the valve that connects the heart to the rest of the body. It can be caused by accidents or high blood pressure and can be life-threatening. If this is the case, surgery is required. Stress can cause right-side chest pain and worsen it. Stress can usually be dealt with through lifestyle changes and practices like meditation. Rib displacement occurs when a rib is slightly out of alignment. It usually happens after excessive coughing, athletic activities or an accident. This usually clears by itself; but if it doesn’t, it could be a rib fracture, which will require medical care. Fibromyalgia is a serious inflammation of the cartilage and joints in the ribs, similar to arthritis; it can be treated with prescription medicines and pain relievers. Costochondritis is an inflammation of cartilage and joints of the chest bone. It is not serious and can be treated with hot compress, pain relievers and rest. 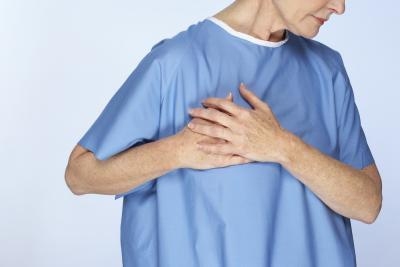 One or more tumors in certain places can cause serious right-side chest pain. It will require medical treatment, usually surgery. The pain does not go away after a few day or starts getting worse. You have fever and/or chills and cough up a lot of mucus. The pain is accompanied by nausea, dizziness, trouble thinking, excessive sweating, a rapid heart rate or heavy breathing. The pain starts to spread to other parts of your body. The pain is accompanied by a feeling of pressure, squeezing, tightness or crushing. The pain causes you to faint or collapse. You are unable to get up or move. The pain is accompanied by low blood pressure or a low pulse. Server responsed at: 04/23/2019 8:22 p.m.